This Sunday's readings call us to be followers of Christ and to tell others about him. In our first reading (1 Samuel 3:3-10, 19), we hear about Samuel, the young man consecrated to God by his mother and in training under the high priest Eli. He had not yet encountered God and didn't recognize him when God called him in the night; but God was persistent. Samuel was sleeping in the temple of the LORD where the ark of God was. The LORD called to Samuel, who answered, "Here I am." Samuel ran to Eli and said, "Here I am. You called me." "I did not call you, " Eli said. "Go back to sleep." So he went back to sleep. Again the LORD called Samuel, who rose and went to Eli. "Here I am, " he said. "You called me." But Eli answered, "I did not call you, my son. Go back to sleep." At that time Samuel was not familiar with the LORD, because the LORD had not revealed anything to him as yet. The LORD called Samuel again, for the third time. Getting up and going to Eli, he said, "Here I am. You called me." Then Eli understood that the LORD was calling the youth. So he said to Samuel, "Go to sleep, and if you are called, reply, Speak, LORD, for your servant is listening." When Samuel went to sleep in his place, the LORD came and revealed his presence, calling out as before, "Samuel, Samuel!" Samuel answered, "Speak, for your servant is listening." Samuel grew up, and the LORD was with him, not permitting any word of his to be without effect. In our Gospel reading (John 1:35-42), we hear about disciples of John the Baptist who are seeking the Lord. 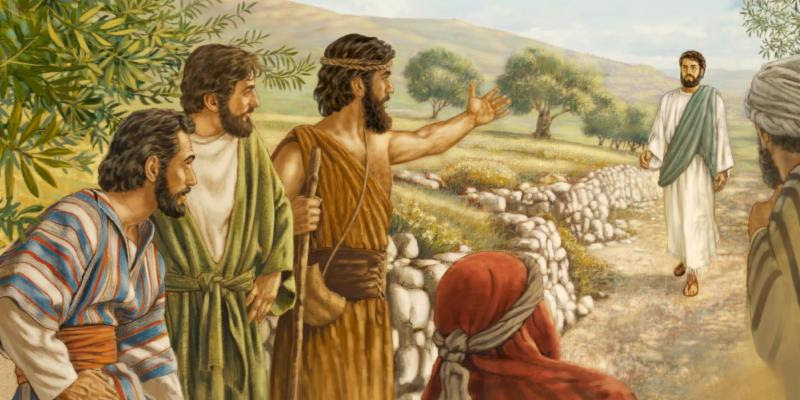 John points them toward Jesus. Jesus invites them to "come and your will see." Andrew then goes to his brother Simon and tells him, "We have found the Messiah." John was standing with two of his disciples, and as he watched Jesus walk by, he said, "Behold, the Lamb of God." The two disciples heard what he said and followed Jesus. Jesus turned and saw them following him and said to them, "What are you looking for?" They said to him, "Rabbi" -- which translated means Teacher --, "where are you staying?" He said to them, "Come, and you will see." So they went and saw where Jesus was staying, and they stayed with him that day. It was about four in the afternoon. Andrew, the brother of Simon Peter, was one of the two who heard John and followed Jesus. He first found his own brother Simon and told him, "We have found the Messiah" -- which is translated Christ --. Then he brought him to Jesus. Jesus looked at him and said, "You are Simon the son of John; you will be called Cephas" -- which is translated Peter. In our Epistle reading (1 Corinthians 6:13-15, 17-20), St. Paul tells us that immorality is contrary to life in Christ. You cannot follow Jesus and be an immoral person. Brothers and sisters: The body is not for immorality, but for the Lord, and the Lord is for the body; God raised the Lord and will also raise us by his power. Do you not know that your bodies are members of Christ? But whoever is joined to the Lord becomes one Spirit with him. Avoid immorality. Every other sin a person commits is outside the body, but the immoral person sins against his own body. Do you not know that your body is a temple of the Holy Spirit within you, whom you have from God, and that you are not your own? For you have been purchased at a price. Therefore glorify God in your body. God's call to each of us is personal, unique and persistent. Christ calls each of us to a unique life with him for a specific purpose. We learn by today's example that in order to find the Messiah, we must seek him. Then we must "go with him and see". Then we must go and tell others, "We have found the Messiah."